For the MotoGP™ championship, Magneti Marelli is the sole supplier of engine control units for Dorna, and for all of the teams that currently feature on the grid. The hardware used offers the highest performance and ease of use, thanks to the adoption proprietary software such as Wintax and Sysma. 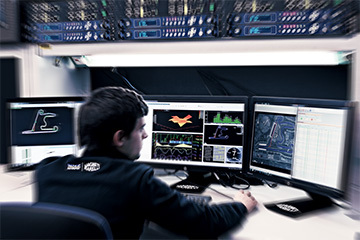 Magneti Marelli provides a complete set of professional software applications dedicated to the analysis of telemetry data and the management of electronic devices. All of our software solutions are the result of years of research and collaboration in close partnership with the most successful teams and manufacturers in motor sport. We cater to the different needs of all competitors, large and small, supplying products that are extremely powerful but at the same time easy to use. This is one area where the transfer of technology between the automotive world and motorsport is constantly growing. With software applications becoming more open and flexible tools for applications that are not restricted to the motor sport environment. With the ever-increasing importance of software products, Magneti Marelli provides continuous development and support and importantly, also allows clients the ability to customise the software to suit the particular application. Last but not least, Magneti Marelli understands that confidentiality of data is important to all its customers. As a result, all the information gathered by the team, either telemetry data or configuration parameters of the vehicle, are protected with advanced encryption systems, always guaranteeing the highest level of security. WinTAX4 software is dedicated to the analysis of telemetry data. Its flexibility allows you to use it at every level of motorsport, adapting to different needs: from the highest levels of motorsport to those who are entering the world of motor sport for the first time. WinTAX4 is appropriate for an individual data analyst or for a team of professional engineers all monitoring telemetry together. The Sysma softwares ability to work with many external applications makes it an extremely powerful and flexible software package that can be easily integrated in third party applications.